This weekend the celeb world took over London’s Hyde Park as part of this year’s Wireless Festival. From Jessie J to Professor Green and Rihanna to Nicki Minaj as well as the TOWIE and MIC crew, the celebs were out in force. As the crowd went crazy tipping back the drinks and carrying off muddy-chic as best they could we were on the lookout for this year’s best festival fashion! Rihanna appeared on stage in a midriff-baring studded top, ‘granny pants’ over stocking and peacock – patterned billowing sleeves with her hair tumbling down by her waist. Jessie J rocked denim shorts over the same striped stockings made famous by Cheryl Cole in 2010 teamed with a white crop top underneath a camouflage jacket. Jessie got a bit too excited with a very enthusiastic kick that nearly revealed more than what was expected! Cher Lloyd went all Hells Angels with her leather shorts, tattoos, religious cross top and biker boots. British singer Rita Ora teamed her army trousers with a cropped t-shirt showing off her toned, flat stomach and a flashy pair of sunglasses. Nicki Minaj smashed Wireless with her funky, wacky outfit. Wearing old-fashioned bloomers teamed with a mini skirt, knee-high boots, patterned tights and a fluorescent jacket Nicki once again didn’t fail to disappoint on the out there fashion front! As for the guys, Rizzle Kicks went all out in their multicoloured jumpers as they wowed the audience and as always Pitbull was suited and booted with a flashy pair of designer sunglasses. Sticking to her usual and much-loved style, Caroline Flack was spotted showing off her long brown legs in tiny shorts with a shirt tucked in and to keep warm a black leather jacket. Never far away from a party, the TOWIE cast were spotted mixing in the crowd looking festival ready. Lydia Bright led the girls in the fashion stakes in a very patriotic red, white and blue outfit with Union Jack wellies whilst Sam Faiers decided a change of look was needed as she donned a long wavy brunette wig making her unrecognisable! Bravely Lauren Goodger rocked out her white converse trainers (didn’t she know there would be mud around!) and showed off her fab new figure in denim shorts and a black vest top. And finally, hiding backstage were The Saturdays. Rochelle Wiseman covered up her gorgeous floral playsuit with a less than glam rain poncho teamed with Hunter wellies and a leather jacket. 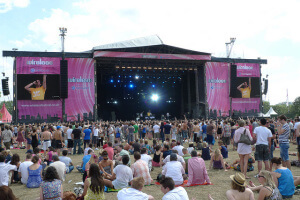 Also in attendance was our very own Chloe August showing off her festival chic in a pink mac teamed with a pair of Raybans (so we are told)….unfortunately we are still waiting for a photo! Overall, given the unpredictable weather of late, we think this year’s celebs didn’t do too badly with their festival fashion! What has been your favourite festival look so far this year?